Which Priority Health Medicare plan is right for me? 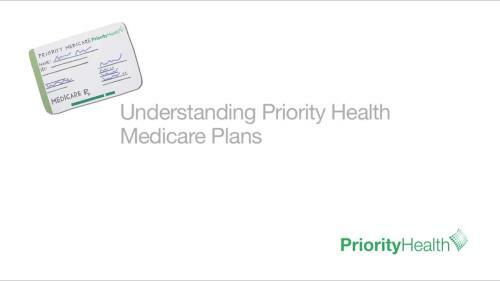 Priority Health offers Medicare Advantage with prescription drug plans (MAPD) and Medigap (Medicare Supplement) plans. PriorityMedicare KeySM (HMO-POS) - The monthly premium for this plan is $0. This plan has a low in-network deductible, and there's no maximum benefit limit. PriorityMedicare IdealSM (PPO) - Coverage at a low cost no matter where you live in Michigan's Lower Peninsula. Monthly premium is just $14. PriorityMedicare ValueSM (HMO-POS) - This plan provides you with predictable copayments for things like doctor visits and prescriptions. With low monthly premiums that start as low as $8 to $61. PriorityMedicare MeritSM (PPO) - Our value priced PPO gives you a little more flexibility than our HMO-POS plans. Monthly premiums start as low as $42 to $88. PriorityMedicareSM (HMO-POS) - Get lower copayments and out-of-pocket costs than you would with PriorityMedicare Value. Monthly premiums start as low as $78 to $153. PriorityMedicare SelectSM (PPO) - If you like the freedom a PPO plan offers but need a little more coverage than you get with PriorityMedicare Merit, consider this plan. Monthly premiums start as low as $137 to $197. Your monthly premium is based on the county you live in, as well as your age, gender, health status, use of tobacco and your eligibility for either open enrollment or a guaranteed issue right. Medigap Plan A - Pays your copayments when you're hospitalized and coinsurance when you see your doctor or get outpatient hospital services. Plan A is one of the Medigap plans available to Medicare-eligible people under age 65. Monthly premiums start as low as $88. Medigap Plan D - Includes everything in Plan A, plus it covers your Part A deductible, skilled nursing copayment and foreign travel emergency services. Monthly premiums start as low as $135. Medigap Plan N - Includes everything in Plan D, but you'll have copayments for doctor visits and emergency visits. Monthly premiums start as low as $97. Medigap Plan G - Includes everything in Plan N, plus you won't have copayments. You'll have to pay your Part B deductible, but excess charges over what Medicare approves will be covered. Monthly premiums start as low as $126. Medigap Plan C - Covers your Part A and Part B deductible. Most Medicare-approved out-of-pocket expenses are also covered. Only Medigap Plan F offers more coverage. This plan is also available to Medicare-eligible people under age 65. Monthly premiums start as low as $153. Medigap Plan F - Includes everything in Plan N, but you won't have copayments. It also covers your Part B deductible and excess charges over what Medicare will approve. Monthly premiums start as low as $158. Medicare for Dummies, our ebook, will help you understand all of your Medicare options, including how you can get a plan that covers everything Original Medicare does plus benefits like prescription drugs and dental.